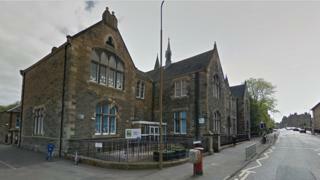 A row has broken out over a plan for a change to Gaelic education in Edinburgh. Some children who leave the city's Gaelic school this year may not be going to the secondary school they had expected to go to. Their parents are angry, and have claimed that the move could undermine Gaelic education in the capital. The plan will be discussed by the City of Edinburgh Council at a meeting on Tuesday. Children who attend Bun-sgoil Taobh na Pairce, the Gaelic primary school that opened in 2013, have been able to continue their education in Gaelic at James Gillespie's High School in previous years. However, parents were told recently that their children would not be automatically entitled to a place there because of the increasing size of the overall school roll. Instead children who do not live within Gillespie's normal catchment area will be offered a place at Tynecastle High School, which also has Gaelic facilities. Critics claim the Gaelic facilities there are inferior to Gillespie's. Some have also highlighted the school's relatively poor academic performance, although its catchment area includes some of the most deprived parts of the city. Critics of the council's proposals include the Moderator of the General Assembly of the Church of Scotland, Dr Angus Morrison, who is a Gaelic speaker. He said the move could have "potentially disastrous consequences" for the long term provision of Gaelic education at secondary level in Edinburgh. Dr Morrison said he was particularly concerned about the effect on P7 children who had already started their transition to Gillespie's but may now need to go to Tynecastle instead. He added: "If parents are not confident about the secondary education this could have an impact on the number of families committed to making their children part of a drive to revitalise this fragile language which is an important part of Scotland's heritage." When children leave the Gaelic school their parents have a choice: essentially they can either choose to send them to a secondary school which is also able to provide some education in Gaelic, or send them to the secondary school whose catchment area they live in. The council is proposing to make Tynecastle - rather than Gillespie's - the Gaelic option this year. In many parts of Scotland, children who get their primary education in Gaelic have no choice but to go to a secondary school where no Gaelic is taught. At Gillespie's, there are a significant number of students who are able to speak Gaelic and a few subjects - including PE, Art and Modern Studies - are available in the language, although most subjects are only taught in English. Some students go on to study for a Higher or Advanced Higher in Gaelic. A total of 243 pupils were down to start at Gillespie's this August - either from the Gaelic school or the English language primaries in its normal catchment area. The council said it expected this to drop to 229, but there are only 220 places available - which is still an increase on previous years. The council's education convener, Paul Godzik, said this meant that a "very small number of children" from outside James Gillespie's catchment area might not be able to be placed at the school. He added: "We are aware of concerns raised by some parents regarding potential S1 pupil numbers at James Gillespie's High School and Gaelic provision. "These are currently being considered ahead of tomorrow's meeting of the Education, Children and Families Committee where the report will be discussed by councillors. "The council continues to provide a significant commitment to Gaelic education in the city as shown by the opening of the dedicated primary school in 2013 and increased provision at Tynecastle and its cluster primaries. "Gaelic is embedded very successfully into the life and ethos of many of the schools which use the language for their pupils' learning."